Brightly coloured and pleasingly patterned, ladybirds are among some of our most beloved and familiar invertebrates. Their role in helping to protect our crops by devouring huge numbers of pests has firmly established these tiny, flying beetles as the gardeners' friend. 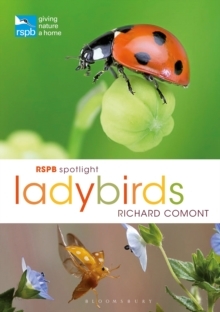 Spotlight Ladybirds focuses on the 26 species that are resident in the UK, from the widespread but unusual Orange Ladybird to the rare - and aptly named - Scarce 7-spot Ladybird. Ladybird expert, Richard Comont considers the conservation challenges facing these iconic species, whose populations are now at risk thanks to the threat posed by one of their own, the invasive alien Harlequin Ladybird. And he covers all aspects of ladybirds' biology, from tiny larvae emerging from their oval eggs to large aggregations that converge at specific sites around the world. Richard also examines the natural history and cultural significance of this fascinating group of beetles, from Ladybird Books to Thor. The Spotlight series introduces readers to the lives of our favourite animals with eye-catching colour photos and informative expert text.